This is a media converter that converts a 10/100/1000Base-TX(RJ-45) to 1000Base-BXU(SC) via a 1310nm/1550nm bi-directional (BiDi) single-mode fiber (SMF) SC connector, which allows distance reach up to 20km. This provides a cost effective conversion from 10/100/1000Base-TX(RJ-45) to 1000Base-BXU fiber, while extending the network reach beyond the 100m reach limitation of copper. 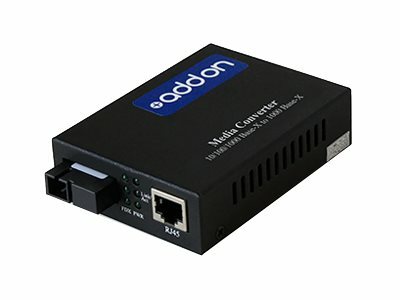 This AC/DC powered PoE media converter is a power sourcing equipment (PSE), which combines data transferred over a fiber optic link with 48V (or other voltage) power supply, providing power to IEEE802.3af powered device (PD) over CAT5 and up UTP cable (cable length up to 100 meters / 330 feet). It complies with the IEEE802.3af standard. The converter includes a single port PSE controller, which offers PD signature sensing and power monitoring features. Other features include over-current protection and LFP function. The LFP (Link Fault Pass-through) allows the media converter to monitor both the fiber and copper RX port for loss of signal. In case of a loss of RX signal on one media port, the converter will automatically disable the TX signal to the other media port, thus passing through the link fault. The media converters are 100% compliant for all of the networking needs. Now you have a cost effective solution to your network upgrade needs.